We had a magic trip – 3 weeks in Belize under the stunning organisation of Absolute Belize. A perfect mix of beach and jungle, laid back bars, luxurious accommodation and easy transfers. We would go back and use Absolute Belize in a heart beat! 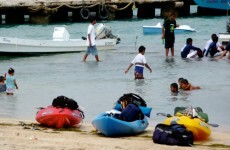 On April 26th 2010, 35 two man teams took off from the lagoon side of San Pedro, Ambergris Caye for the 6th annual reef eco-challenge, a 42 mile, two day kayak race. The grueling race takes the kayakers through the many lagoons in the North Ambergris Caye area, up to Bacalar Chico, then down to Robles Point, where all teams camp for the night. The race then resumes the following day, finishing in Central Park, San Pedro Town. The purpose is to promote awareness, protection and conservation of mangroves, lagoons, reefs and the diverse species found in these natural habitats. The concept was originally inspired by Mr. Elito Arceo, owner of ‘Seaduced’ tour company and it has blossomed into a national event, welcoming participants from country wide. The whole town comes out to spectate, whether on boats, catamarans, on docks or the beach. Central park is a hive of activity with live music, local food and drink stalls and kids splashing in the sea.